I have an article currently featured in the Disability Alliance of British Columbia Magazine called TRANSITION. Read the article: Understanding the Spectrum of Violence. (Find on Pages 8 and 9). I am currently in the process of raising money to go to the “New Maternalisms”: Tales of Motherwork (Dislodging the Unthinkable) conference through April 30th to May 2nd in NYC. Every little bit counts! For information on donating to help me get there, click here. For information about the conference in NYC, click here. Read new interview with Jewelles Smith! Click here! Read the article: Identity, Disability and Language. "Back in 2007, I graduated and received my Master's Degree in Women's Studies from Simon Frasier University. At that time, I was seven years into higher education and the pursuit of learning. I completed that degree by landing myself in the hospital for a week." Hello Everyone! If you’re living in Vancouver or nearby, please come out to this event. The U.S. Congress designated October as National Disability Employment Awareness Month. From an international perspective, the author explains how economic hard times are particularly harsh for women with disabilities. As national governments and institutions struggle to emerge from worldwide recession, the voices of women and members of minority groups are glaringly absent from discussions. Women like me who are living with disabilities are doubly silenced. First, our issues are not addressed by an ableist society; and second, many women’s organizations do not address the specific concerns of disabled women in an economic crisis. Women With Disabilities Australia calls us the Forgotten Sisters. As governments create billion dollar packages to bailout big business, many smaller grants and funding sources that are essential to our livelihood and well-being are being cut or delayed to compensate for deficits. As a woman living with disability, I have worked hard to situate myself in employment that is flexible for my health; stimulating and within my field of education and expertise; and that financially supports my sons and me. As have others with disabilities, I’ve been able to find that work mostly in the non-profit sector. Unfortunately, due to the economic downturn, the NGO supporting my primary contract had to lay me off suddenly in January 2009. Seeking new employment, always a challenge for someone in my situation, is almost impossible during a recession. I heard from one NGO after another—their funding has not come through or has been cut as the government cuts corners to meet its bailout promises. As a consultant without unemployment benefits, the difficulty of my job search is compounded by my struggle to provide shelter and food for my sons as I face poverty, potential homelessness, and loss of medical supports and medications. Even in a normal economy, women with disabilities experience one of the highest rates of unemployment, higher than disabled men, and greater than non-disabled women. The reasons why are often complex. Myths held by employers and society at large lead to hiring practices that exclude persons with disabilities from even entering the work force. During an economic downturn, companies may believe that hiring disabled persons will cost an exorbitant amount of money when, in fact, most persons with disabilities require few accommodations that are generally inexpensive. Further, studies have shown that too many employers favor keeping male employees during layoffs as they are still seen as the “breadwinners.” There is little consideration for the impact that a loss of income will have on a family in a woman-headed household. “The World Global Survey” in 2005, cited by the European Women’s Lobby, found that 40 percent of respondents believed men had more right to a job during layoff periods than women. According to the UN Enable Factsheet on Persons with Disabilities, a “2004 United States survey found that only 35 percent of working-age persons with disabilities are in fact working, compared to 78 percent of those without disabilities.” Further, the study found that “two-thirds of the unemployed respondents with disabilities said they would like to work but could not find jobs.” Employers who are not educated in accommodation/accessibility issues might erroneously believe it is too expensive or complicated to make workspaces accessible and therefore miss out on the value women with disabilities bring to the workforce. In fact, according to the Canadian Human Rights Commission, the average cost to create an accessible space is less than $500. Statistics show that once hired, persons with disabilities have a much longer retention rate. By excluding a large part of the employable population from the discussion on how to move forward and out of the recession, nations will not be able to reconstruct their economy fully. Hiring practices and bailouts that exclude women with disabilities will only reinforce discriminatory practices. Not only will nations lose out on the skills and experience of this population, but formerly independent and self-sufficient workers will become dependent, destitute and isolated. I am hopeful that my own situation will turn around. I am learning from this experience and collaborating with other women with disabilities, single parents and the NGOs that we work for to find a more workable solution. In the future we hope to have a mechanism in place when the economy turns so that government bodies—both national and international—bring all members of society to the table when deciding how to generate economic stimulus and viable employment. Women with disabilities who want to work have a right to paid employment. According to international and national human rights laws, we are guaranteed access to education and employment as part of our basic human rights. Especially during times of economic downturn, it is imperative that vulnerable populations and their contributions to the economy and society are not forgotten as panicking policy makers scramble to hold the market up. Excluding specific groups, whether by ignorance or with purposeful discrimination, is unacceptable. My Oma (Grandmother) was one of the most influential women in my early years. She was born in Ulkebøl, Sonderjylland, Denmark on August 31, 1925. 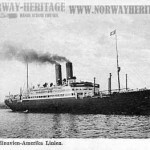 In 1933, she came to Canada, traveling on the Frederik VIII which left Copenhagen, Denmark on March 17, 1933 and arrived in Halifax, NS Canada March 26, 1933. Her family lied about her age to save money on the fare. The Lutheran Church paid for the trip. Senta’s family had come over ahead of her, a fact that affected her the rest of her life. Upon arrival in Canada, she joined her family in Toefield, Alberta, Canada. This is the story as told by her younger sisters, however, my grandmother told me on numerous occasions that she did not live with her parents and sisters much of her childhood. She had five younger sisters. Henny was born in Denmark or Germany, depending on the source of information. Her other four sisters were born in Canada. All the records that I have been able to locate are related to historical information about her mother and grandparents. There is almost no information available about her father. The story is that he was a fisherman from Germany working in Denmark and that her mother was a farm worker. They conceived Senta before they were married in Denmark. I am still unable to locate the records on this marriage and her birth. Senta had severe asthma and numerous other health issues, perhaps related to her bout of tuberculosis in 1947. She also had heart problems and diabetes. She was cognitively alert up until her death in 2000. She was married three times. However, she lived with, but did not marry, my grandfather (Mervin Skundberg). Fred Basserman: married in 1943- separated 1946/7 and divorced 1955. This was an arranged marriage (by her father) when she was 19. They became a couple shortly after Senta was released from the hospital for her Tuberculosis. They separated in 1952 when my dad was approximately two years old. C. Alfred Fuller: They married in 1956. My Oma once shared with me that she and Alfred had negotiated their marriage, not long after my grandfather left her with the three boys. Grandpa Fuller wanted two children of his own (they had a girl and a boy together). He adopted my father, but not the older two boys. She was widowed in December 1975 when he died from Hodgkin’s Lymphoma. 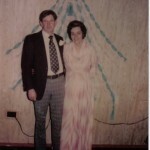 They married in 1976/7 (approximately). He was much younger than her and survived her when she died in 2000. Senta was hospitalized in 1947 for one year when she contracted tuberculosis. While she was sick in the hospital, her mother was caring for the boys. The family, thinking she was going to die, began to disperse her belongings and make plans for the care of her children. She was so outraged by this that she recovered—that was her story that she shared with me. Unfortunately, this led to a lot of bitterness between my grandmother and her family over the years. She never got over feeling abandoned by them when she was left in Denmark as a child and several other occurrences over the years contributed to the bad blood. She raised five children, sometimes alone. She took me in and helped me to get through the criminal court case against my stepfather when I was eleven. I had been in foster care and she decided that the best place for me was with her. She displayed a tenderness towards me that I had rarely experienced in my life, including one time when I had the flu and was terribly sick. She sat with me, holding my hair, as I was ill. She stayed beside me over several days until I was recovered. That was such a cherished memory, and such a lesson on how to show tenderness to the ones you love. The year I spent with her was so important, as she allowed me to have a space where I could recover and process the trauma that I had experienced prior to living with her. Senta raised me to be a strong woman. She and I did not always agree, but she encouraged me to be opinionated and to push at boundaries. She was politically engaged, especially in her 40s and 50s. She had to be – she lived outside of the parameters of her time. She ended an abusive arranged marriage, had a child (my father) outside of marriage, survived a life-threatening bout with Tuberculosis, entered into a negotiated marriage with a much older and kind man, and, after being widowed, she married a much younger man and lived with him until she died. I often ponder the last conversations she and I had. One was with regard to my decision to have a tubal ligation after the birth of my youngest son and third child. She was very much against this decision and felt that it would impact my prospects of marriage in the future. We also discussed my entrance into university. She was very proud of me for taking this step. I wish she had lived to know that I eventually finished my Bachelor of Arts degree and a Master of Arts and Social Sciences degree. I wish she knew of the work I do for women’s human rights and disability human rights. Finally, we discussed the terrible rumours (started by one of my cousins) that she had, until that point, heard and believed. She used some of that last conversation to “set things right” as she said. She apologized to me for believing these lies and for speculating with others while not actually discussing them with me, the subject. This act taught me much about her own sense of right and wrong. She could have died and never said a word to me. That she made time to speak to me meant so much. Sometimes her advice seemed archaic to me, especially in the context of her encouragement and love for me; however, she was never wrong. She lived to see me start my university year. She was very much aware of social and political activism and although I did not realize it at the time, her outspokenness with regard to politics came through and inspired me, as did her fortitude and determination to live the life put in front of her. I am exhausted and so overflowing with information that I am sure will take weeks, if not months, to digest. I am incredibly grateful for the opportunity I have in attending this 6-week Institute on Women’s Human Rights. This past week our class more than doubled as we had women join us for an intense introduction to the United Nations Convention on the Elimination of all forms of Discrimination Against Women (CEDAW). We covered its principals, Optional Protocol, General Recommendations, and studied examples of how CEDAW is used in specific cases; I have gained so much insight into how I can use this Convention in connection with ICRPD and my own work in the area of Human Rights for women who live with disabilities. We had such incredibly inspiring Speakers all week. I feel like my world has stretched out to all corners of the earth and that the possibilities for change are tangible. The world is a scary space of conservatism and backlash, yet despite this push against them, women are stronger than ever. Their determination is fuelled by their connections to their communities and the possibilities we see around every corner, in every square, on every march/walk and citizen eruption of protest. I am leaving this week rejuvenated and inspired. Speakers this week included: Dr. Martha Morgan, Alda Facio, Denisse Tamin Rosenfeld, MA, and of course, Angela Lytle, M.Ed. After the first day of Workshops and Lectures, we gathered together for a short reception. Many members of the community and university came out, and I met Yin Brown, Program Officer of Advocacy and Alliances. We also gathered at the end of the week for a lovely meal and visit post-CEDAW week. I cannot state often enough what an incredible opportunity it is for so many women human rights activists from throughout the globe to gather and share our stories. The formal and informal discussions will lead, I am certain, to many long-term relationships and future collaborations in projects and activism. During this entire week, we have all been aware of the struggles going on across this country for student rights, especially in Quebec. Further theactivism against the proposed Federal budget has been in the forefront as well. Knowing that the Canadian government is dismantling so much of what has made Canada a great example of Human Rights Equality is disheartening, however, the voices of dissent that have risen and joined forces keep hope alive. To those in the front and on the streets: Be Strong.To those in the political arena: Canadians are being mobilized and we will not stand for our country to fail to live up to its obligations. Today we continued the discussion of International Human Rights Treaties and how they function. Last night for homework we were to read a series of articles on self-care, yoga and meditation. In the afternoon we watched the documentary film: “The Vienna Tribunal”. I decided to share a poem I wrote in 2007 on the action of “bearing witness” to another person’s trauma. Up front, this poem is deeply personal and potentially triggering. I have attached it at the end of this post. The readings last night actually triggered me. I have had an aversion to yoga and meditation for a long time, stemming from therapy sessions in which meditation, that is, meditation where one clears the mind, caused me to flash back. Yoga, I have attempted, but I believe the instructor at the time did not take care in her instruction, and as my joints hyper-extend and I tend to be the type of person to “over-do it”, I ended up injured and in pain. I did not attend the first yoga session, but I am going to attempt to attend the next one and observe. Of the reading package for last night, I particularly was moved by two of the articles. The first was Jane Barry’s: “What’s the Point of the Revolution if we Can’t Dance” and “An Exploration of Self-Care: Excerpt from ‘Self-Care and Self-Defense Manual for Activists”—by CREA New Delhi. The poem at the end of this post was inspired by the act of professionals who bear witness daily in their work. As I listened to Alda talk today about her experience the day of the Tribunal. So many people sat for the full hours as story after story was told about the violations they and/or their sisters had done to them. Alda stated that her body actually hurt for days from holding all the pain of the women. It is imperative that we as a movement take the time to care for our selves, our health, our bodies. Two final thoughts from Alda regarding the current state of the movement: “we live in societies that do not know their histories” and “how do we sustain the feminist movement?” These are thoughts that I have pondered often in the past year. We need to record the histories of our movement, we need to teach the upcoming generation where we have been, where our sisters who lived before us have been and what our thoughts on the future of women’s rights. Hear you. Believe you. [With both ears]. Hold on. Hold my hands together. Firm.